Ford Explorer is the modern American station wagon. Ford sells more than 400,000 Explorers a year, making it the best-selling SUV and the sixth best-selling vehicle in America, and it's held these titles for a dozen years. Though quite capable as a tow vehicle and able to venture off the highway, most Explorers, like most SUVs, spend their entire lives shuttling people and performing the duties station wagons performed when Baby Boomers were growing up. The Explorer answers this call admirably and comfortably, which is part of the reason it's so popular. The Explorer is roomy and comfortable. It's capable of seating seven people when equipped with the optional third-row seat that folds flat into the cargo floor when not being used. For more luxurious comfort, second-row sport bucket seating is now available on Eddie Bauer and Limited models. Buyers can choose between V6 and V8 engines, but the V6 provides plenty of power unless you're pulling trailers or live in the Rocky Mountain states where the air is thin. Part of the reason for this is that the Explorer benefits from a superb five-speed automatic transmission. Safety features abound: Anti-lock brakes come standard, and side-curtain air bags, designed to provide rollover protection, are optional and highly recommended. Ford's AdvanceTrac electronic stability system is available for all XLT, Eddie Bauer, and Limited models, providing improved traction and safety. Full-time all-wheel drive is available, providing better handling stability on slippery surfaces, and a tire-pressure monitoring system is available. Ford redesigned and completely re-engineered the four-door Explorer two years ago (for model year 2002), and it's a much better vehicle. The current model rides on a wider track and a longer wheelbase, giving it a more solid, more stable stance. Its newly developed independent rear suspension gives it a smoother ride and better handling than SUVs with traditional live rear axles. 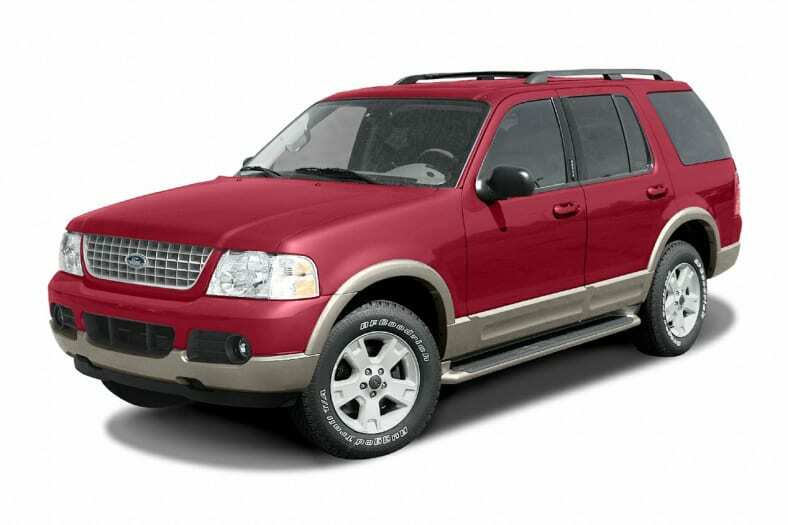 New Car Test Drive chose the Explorer as the best all-around sport-utility vehicle for 2003. It earned this title for its ability to carry four to seven people in comfort, pull a trailer, and venture off-road. The Explorer is rated to pull a trailer of up to 7,140 pounds when properly equipped, and though it does not excel at off-road travel, it can go most of the places most of us need to go.